I have travelled all over the world in a bid to capture photographs, but sometimes the most interesting subjects have been right on my doorstep. This image was taken very close to where I do all my writing. The bird is a grey jay, which is a member of the crow family. It’s a bird that I have a strong connection with and one that has virtually no fear of man. The grey jay is found all across north-east America and people are always surprised by the fact that these birds will eat out of your hand. They are highly intelligent and will occasionally steal food, hence their nickname ‘camp robbers’. 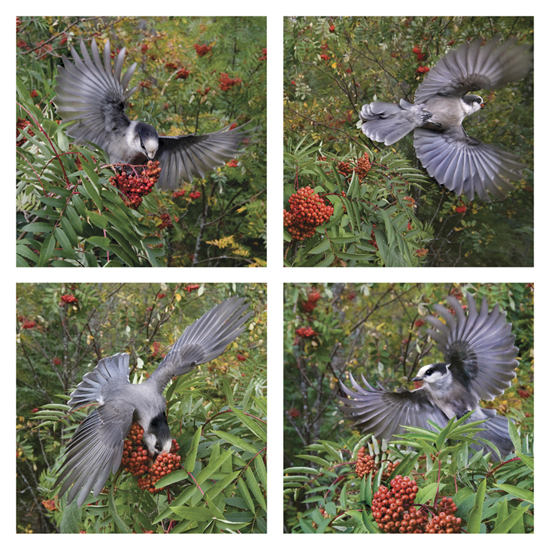 In these images you can see a grey jay trying to feed on the mountain-ash berries that grow next to my cabin. One day I rigged up a couple of digital cameras with wideangle lenses and set them up outside. That is how I managed to capture this sequence. I was in my cabin writing at the time, but I kept an eye on the tree outside. It took me the good part of a day to get these pictures, as every time the bird flew into the tree I’d fire off shots using a remote trigger. One of the fascinating things about all this is that I’ve actually been searching for a grey jay nest for around 30 years. Being so tame, you’d think it would be easy to find a nest, but the problem is that these birds actually change their personalities during the nesting season, becoming cautious and hard to find. I’ve tried every trick in the book to try to find a nest, even going so far as to put a notice in a newspaper requesting that people contact me if they find one. On another occasion I even fed them dead mice and put little radio transmitters inside so I could track them, but to no avail. I know for a fact that these birds nest within 200 yards of my home and yet I still can’t find them. Once the nesting period is over they go back to their normal behaviour and expect free hand-outs of food. That should tell you just how clever these birds are and there’s still a great deal of mystery about them. I presented these images as a sequence because it felt right to do so. It was intuitive and a great way to show the bird in many forms. Seeing the series of movements in the images makes me think of ballet. On another level, I put four pictures together because I simply couldn’t decide which one I like most. You get a sense of rhythm from these images. It’s rare that I’ll do a sequence of shots, but here I think it works well. My background is in magazines and creating picture stories through a series of images, so I was able to apply that kind of principle here. The order of the images was really dictated by each one’s composition. For example, in the top-left image the bird is diving down into the frame and in the bottom right it’s diving up into the composition. I think this gives the overall sequence balance. Many photographers will take a picture of something that simply appeals to them on a visual level, but I like to go a little deeper. I want to have an emotional connection with my subject. People are always looking for the secrets that the professionals have and it’s surprising how many people assume it’s to do with having the latest equipment. Others assume it’s about the area you live in or the magazine you work for. The only thing that I have is passion. That’s the thing that I like to emphasise. The passion I feel when I’m working is in my heart and in my gut. Once you have that, you will find that your images will be better.